"LEI 2010 Euro Spring Tour"! Paris, The Netherlands, Brussels -- The Eva Ink Artist Tour for May 2010 is underway! And this year sees the bi-annual event reprising the successes of two years ago by bringing back two illustration heavy hitters for the adventure-- creator Michael Golden and illustrator Joe Jusko! "I admire the work of both of these talents immensely," says Renee Witterstaetter of Eva Ink Artist Group, "And I'm very happy to welcome them both back on the tour. It's seldom that we invite the same creators back so soon, but the demand for Joe and Michael was high, both from the fans of their work in Europe, and from the store owners themselves!" And it's certainly no wonder! Artist/writer/creator Michael Golden, co-creator of the X-men's Rogue character, is known for his detailed pencil work on "The 'Nam," "Micronauts," "G.I. Joe Yearbook," and "Dr. Strange, " among much more! Milestones in Golden's career include the co-creation of "Bucky O'Hare," which led to an animated series and toy line designed by Michael, "The Mirconauts," as well as "Spartan X" with editor Renee Witterstaetter. Currently, Golden's work can be seen with new covers on "Spiderman 1602," "Iron Man", "Heroes for Hire", "X-Men," "Demon's Regret, " "Mice Templar," and many more. In addition, Vanguard Production's extensive art book, "Excess: The Art of Michael Golden," is on a second printing, while Creator Chronicles has also recently released a two part candid DVD on Michael and his career. Michael has served as an Editor at DC Comics as well as Senior Art Director at Marvel Comics, and has worked on scores of movie production projects, including some currently in development. His art has been the focus of gallery shows in places as diverse as Gijon and Barcelona, Spain, New York, Antwerp and Brussels, while his class on storytelling has been conducted from Spain to Brussels to Canada to The United States and most recently in China. He was recently honored with a Lifetime Achievement Award in Lille, France. Following the successful "Heroes and Villains" sketchbook" released last year, Michael's new hardcover art book "Michael Golden: MORE Heroes and Villains," has just hit the stands, and his work on the Eva Ink project "Kerry and the Scary Things," is due out in October. Joe Jusko is undoubtedly one of the best known Fantasy, Pin-Up and Comic Artists in the world today. His career has spanned almost 30 years, starting with the sale of his first cover for Heavy Metal Magazine in 1977 at the age of 17. Since , Joe has worked for almost every major comic book publisher, producing hundreds of images for both covers and interiors. In addition to his work at Marvel over the years, Joe has produced art for many other companies and characters, including DC Comics, Crusade Comics, Innovation Comics, Harris Comics, Wildstorm Comics, Top Cow Productions and Byron Preiss Visuals, to name just a few. His recent work includes miscellaneous cover paintings for 'The Oz/Wonderland Chronicles', 'Vampirella' , and Sheena, among others. The next project due out on to highlight Joe's amazing work is "Joe Jusko: Savage Beauty," a hardcover art book from Eva Ink Publishing. 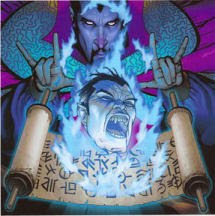 Jusko's work has earned him myriad awards and honors, including two "Favorite Painter" Wizard Fan Awards, multiple trading card awards, a Golden Lion Award from the Burroughs Bibliophiles (previous recipients include Frank Frazetta and Boris Vallejo) and a Chesley Award nomination for best cover . "We look forward to seeing all of our friends at all these stops," continued Renee, "And, hey, if you are a store in Europe and would like to be on future tour itineraries, drop me an e-mail. We love to work with new people as well, and meet fans we haven't met yet! "Stories from the last two years of tours are legend, " laughs Renee. "It will be exciting to see what this year holds." Michael Golden Sketch Policies, May 2010--Hurrah! 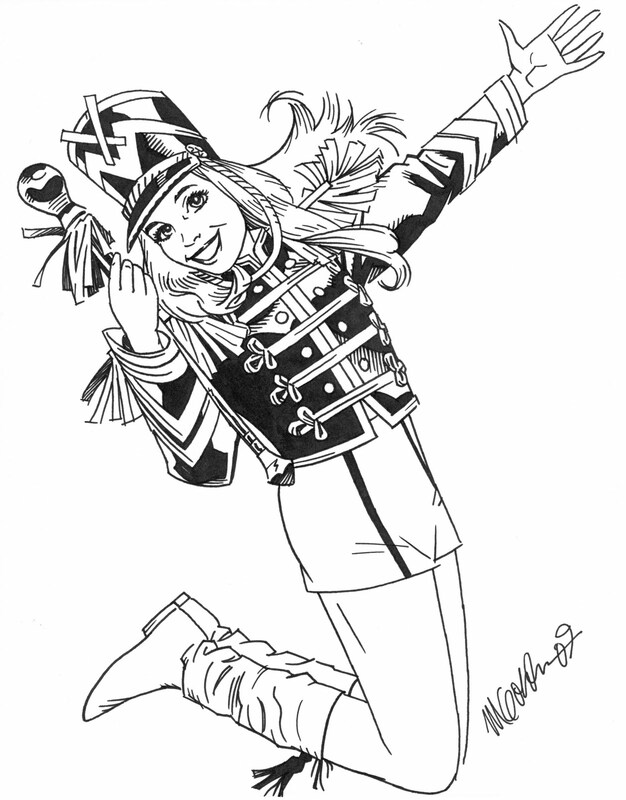 Just a note to inform all of you of our sketch policies for one of our artists in high demand, Michael Golden. Currently, Michael's take home list if full. He is not accepting any commissions to be done at home, until the current list is finished. And even then, he will probably only open the take home list for cover-quality pieces. Not convention sketches. Since he is so busy with other projects, and just life in general. His take home list has been very lengthy, mostly my fault, since when he first came back on the convention scene in 2006, I under-estimated the demand and charged too little. On top of that, Michael just isn't capable of doing "sketches." He does finished pieces. Those are things you just can't bang out. Good news is that his take home list is almost done. Bad news is, as said, it probably won't open up again. That's the short story. Note that Mr. Golden takes around 1 hour or more to do a full-figure sketch, so his space at any show is limited. And finally, those of you on the take home list still awaiting your sketch-- which there are very few of you now. Baggering me, threatening me, harrassing me, calling me names--etc. etc.--is not going to get that sketch any quicker. Granted, it won't delay it either. I'm not that petty. But it won't expedite things. Michael is one person. I wish there were two of him. Believe me I do. Or THREE! Can you image how awesome that would be! The work we could get done! 1.) Take home list is full. 2.) Not accepting any more take home requests. 3.) If you are on the list, you will get your ordered sketch. No guarantees on time, but he's almost done with his list. 4.) Studio Commissions list will probably not open up again, except for cover-quality commissions, of which we'll accept 2 at a time, only. 5.) Golden will still sketch at conventions. 6.) When the cover quality commission list opens up, I'll announce it here. Thank you all for your interest in Michael's work. I never met Frank Frazetta. 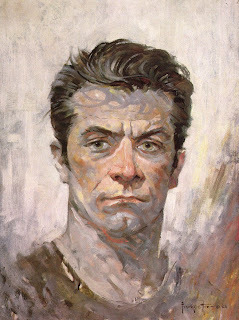 Frazetta was indeed one of those bigger than life alpha male personalities, I think, that infused his work with part of his own being, as surely as someone like a Buster Keaton was able to infuse his in the characters he created on celluloid. What Frank gave to his work was indefinable. But it didn't stop people from trying to define. There was just something about Frazetta's paintings. A power, a savagery, a beauty, a rawness, a subtly, all mixed together, that many have oft tried to copy, without success. Sure, they sometimes get close to mimicking by recreating in measured brush strokes what Frank did with a mad-genius staccato, but what can never be mimicked or recreated, or copied is a soul. And that's something Frank's work had in spades. People that know me have heard this rant before, but I lament the advent of the digital age of painting. Yes, many of my friends are making a good living doing digital pieces. I for one think it's a dangerous and slippery slope... probably just because I love originals. I'm biased. I admit. I love walking into a museum and seeing the actual painting on the wall, noticing the little cracks in the aging canvas, realizing that that mark is most likely the artist own thumb print, or that painted over hair could be his own, or perhaps a sable strand out of his or her own brush. That is exciting to me! I'm glad he didn't. My dreams and my imagination would be alot less populated. My point being that the romance of a certain age, a certain style-- that never really goes out of style--the power of a well-written tangible bound book, or the beauty of a fierce and masterful oil painting, has a life of it's own that transcends the ages. That is how I have always felt about Frank Frazetta's work. His Conan pieces, his King Kong cover, his voluptuous women, down to the way the moss grows out of rotting tree stump in his worlds-- unmistakable Frank. When I joined the Society of Illustrators in Manhattan some years ago now, what drew me in was the sense of history of the place. Walking in and having a glass of wine or lunch, surrounded by the originals of Montgomery Flagg, N.C. Wyeth, Norman Rockwell, Howard Pyle, Maxfield Parrish... it's mind blowing for someone who loves art...and above the bar there once was a drum (originally owned by Al Parker, now sadly moved to a corner under the clubs new directorship), on which many of these heroes of my illustrated world signed their names-- Rockwell, Jon Whitcomb, C. Peter Helk, Ben Stahl, John Atherton, Tom Lovell, Harold Von Schmidt, Steven Dohanos, Coby Whitmore... and the signature that stood out the most to me, unmistakable-- Frank Frazetta. His passing on Sunday, as much as anything, makes me wonder with the advent of digital books and digital painting and digital pictures, and digital this and digital that.... what originals will we have to hang on the walls 50 years from now? What will survive. What will be thrown away. What will have the time to germinate and become classic? What will define our collective experiences? As said, I never met Frank or Ellie, but I did negotiate one contract with her years ago. I always attribute to Ellie-- who seemed to be a tuff-as-nails kinda business women-- for helping Frank create his lasting persona in later years. The Alpha Male side of him, mixed with his genius and body of work, certainly provided the clay for the production. Of course, he gave her alot to work with. Having been associated with the art world for some time now, there are some things for sure: There are many talented people. Many people that have potential and ability. A much smaller percentage of those people have the stamina or drive to be successful, and even a smaller percentage take their art to that undefinable level, where no matter what they are drawing or painting, the stamp of their individuality is unmistakable. Sure Frank had his own influences, which I'm sure have been catalogued ad nauseum, just as he has influenced countless others. But, whatever he got from his influences, was distilled into something quiet singular. Now that's a Wyeth! Now that's a Parrish! Now that's a Frazetta! When an artist or writer or creative does reach that level, they are golden! They have transcended this earthly plane, beyond the scope of a time measured in the tiny number of years we are allowed. They become part of each person who experiences, and "gets it." Part of our collective experiences, as I said. Part of something that lives longer than any of use reading these words now. Frank Frazetta will be one of those artists for many. The New York Times Obituary on Frank Frazetta reads "Frank Frazetta, Illustrator, Dies at 82; Helped Define Comic Book Heroes." Hum.... I think he defined much more than that. He defined dozens of worlds, he was catalyst and inspiration for countless paintings and prose and movies, of which we'll probably never fully realize. Perhaps some may not even be aware of his influence ON them. Something in the collective ether that touched a lever in so many people's creativity. And it can also be much more simple than all of that. For me, I do know, that every time my dreams take me to Cimmeria , it will be Frank Frazetta who is my prop master, the costumer head, the set designer in that particular dream scape.... and so many others. And for that, and his individuality, I thank him. 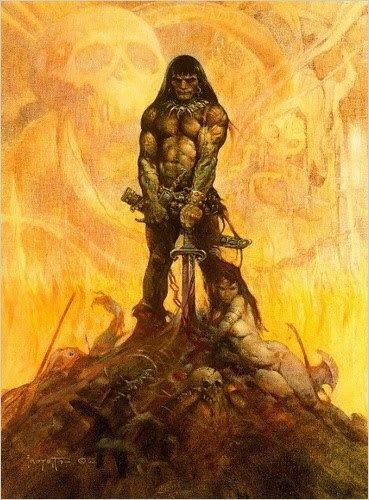 Frank Frazetta, an illustrator of comic books, movie posters and paperback book covers whose visions of musclebound men fighting with swords and axes to defend scantily dressed women helped define fantasy heroes like Conan, Tarzan and John Carter of Mars, died on Monday in Fort Myers, Fla. He was 82. The cause was complications from a stroke, said Rob Pistella and Stephen Ferzoco, Mr. Frazetta’s business managers. Mr. Frazetta was a versatile and prolific comic book artist who, in the 1940s and ’50s, drew for comic strips like Al Capp’s “Lil’ Abner” and comic books like “Famous Funnies,” for which he contributed a series of covers depicting the futuristic adventurer Buck Rogers. His most prominent work, however, was on the cover of book jackets, where his signature images were of strikingly fierce, hard-bodied heroes and bosomy, callipygian damsels in distress. In 1966, his cover of “Conan the Adventurer,” a collection of four fantasy short stories written by Robert E. Howard and L. Sprague de Camp, depicted a brawny long-haired warrior standing in repose on top of a pile of skeletons and other detritus, his sword thrust downward into the mound, an apparently naked young woman lying at his feet, hugging his ankle. The cover created a new look for fantasy adventure novels and established Mr. Frazetta as an artist who could sell books. He illustrated many more Conan books (including “Conan the Conqueror,” “Conan the Usurper” and “Conan the Avenger”) and works by Edgar Rice Burroughs (including “John Carter and the Savage Apes of Mars” and “Tarzan and the Antmen”). “Paperback publishers have been known to buy one of his paintings for use as a cover, then commission a writer to turn out a novel to go with it,” The New York Times reported in 1977, the same year that a collection of his drawings, “The Fantastic Art of Frank Frazetta,” sold more than 300,000 copies. 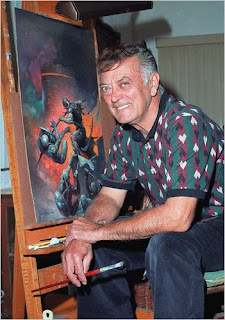 Mr. Frazetta began drawing for comic books of all stripes — westerns, mysteries, fantasies — when he was still a teenager. He was also a good enough baseball player to try out for the New York Giants. The popularity of Mr. Frazetta’s work coincided with the rise of heavy metal in the early 1970s, and his otherworldly imagery showed up on a number of album covers, including Molly Hatchet’s “Flirtin’ With Disaster” and Nazareth’s “Expect No Mercy.” Last year, Kirk Hammett, the lead guitarist for Metallica, bought Mr. Frazetta’s cover artwork for the paperback reissue of Robert E. Howard’s “Conan the Conqueror” for $1 million. Mr. Frazetta married Eleanor Kelly, known as Ellie, in 1956. She served as his occasional model and as his business partner; in 2000 she started a small museum of her husband’s work on their property in East Stroudsburg, Pa. She died last year. Mr. Frazetta is survived by three sisters, Carol, Adel and Jeanie; two sons, Alfonso Frank Frazetta, known as Frank Jr., and William Frazetta, both of East Stroudsburg; two daughters, Heidi Grabin, of Englewood, Fla., and Holly Frazetta, of Boca Grande, Fla.; and 11 grandchildren. After Ellie Frazetta’s death, her children became embroiled in a custodial dispute over their father’s work, and in December, Frank Jr. was arrested on charges of breaking into the family museum and attempting to remove 90 paintings that had been insured for $20 million. In April, the family said the dispute over the paintings had been resolved, and the Monroe County, Pa., district attorney said he would drop the charges. Spider-Man Foils Would be Thief! SPIDERMAN foiled a would-be thief as Jedi Knights blocked his escape route. No, it's not a comic book plot but the scene which unravelled in a Australian book store on Saturday. The 45-year-old called for back-up and the hapless thief was surrounded by superheroes within seconds. 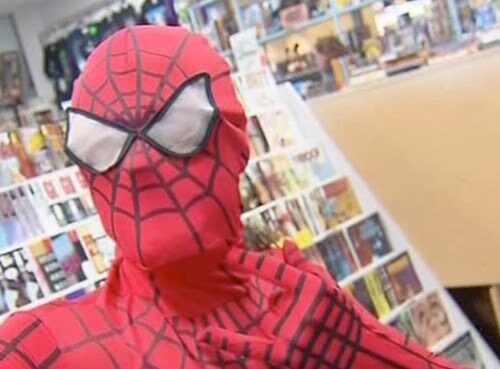 Mr Baulderstone said: "We had about 40 people dressed up as their favourite superheroes to celebrate International Free Comic Day, so he didn't have much of a choice but to hand the comic back after a little bit of a scuffle. "Everyone in the store thought it was a play, that it was street theatre of some sort. It wasn't until I said 'call the police' that people started to realise. "One of the funniest things about the incident was that I called for people to stand near the door and it just so happened we had people dressed as Jedi knights there blocking the exit, the Flash was there at some point too. "It was a bit serious at the time, but now we're looking back laughing at what greeted police."